Welcome to a gallery featuring Minazuki Yamato from the manga and anime series "Kamikaze Kaitou Jeanne"! 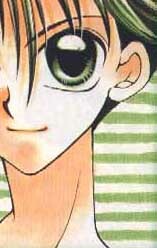 He is the iinchou (class president) in Maron and Miyako's class and his romantic history involves both of them. A few years ago, CloverLabariel and I worked on a fairly extensive joint shrine to this character; we both put in a lot of time and work on it but somehow things never got finalized so in the end the materials weren't published on the web. Rather than leave the scans I made sitting on a Zip disk for even more years, I put this up. Yep, no information on Minazuki can be found here, but there are other KKJ sites where you can find that.